The February/March exhibition season is just around the corner which means that many businesses will now be starting to look at investing a new exhibition display stand. With so many display stand options to choose from, it’s easy for exhibitors to become overwhelmed. Every exhibition stand solution claims to be the best; the one that is the best value for money, the highest on impact, the easiest to assemble. With over 20 years of experience in the event and exhibition industry, we have seen these statements attached to hundreds of products throughout the years - but very few actually live up to their claims. However, one product that does exactly what it says it will do is the Twist display banner stand. Granted, a display banner doesn’t sound like the most exciting product, but the Twist banner stand is much more advanced than a standard roller banner. The the biggest advantage that Twist exhibition banner stands can offer you is their reconfigurable design. In addition to performing as a single display banner, Twist banners can be linked together to create a modular display stand. There is an infinite number of configurations you can create with Twist banners, meaning that you are always certain to have an exhibition solution that is bespoke to your floor space. Being reconfigurable, Twist banners can be adapted for any event. You can remove a single banner for use in smaller venues or in reception areas, or you can attach to several other banners in your desired shape for a larger exhibition stand solution. The FLEXI link panels allow you to make your Twist banner stand bend and flex around corners to create any shape you want to. 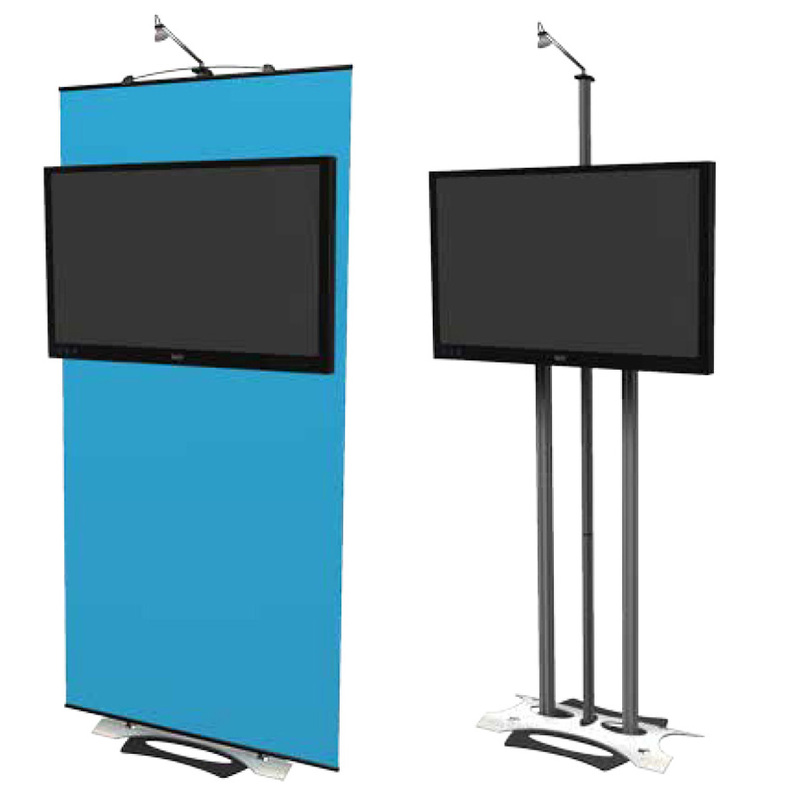 If you are looking for a pre-designed system, take a look at our Modular Twist Displays. Twist display banners are not regular pull up banner stands. The creators of Twist banners took the basic concept of a display banner – a proven and successful exhibition stand solution – and they revolutionised it. Using a patented tensioning system, Twist banner stands are self-levelling. This means that regardless of how uneven the floor is, the Twist banner won’t lose stability and your graphics will remain aligned and straight at all times. The adjustable tension bar at the top of the banner allows you to adjust the amount of tension on the graphic – allowing you to make it tighter or looser depending on your needs. For many exhibitors, one of the most important things to consider when purchasing a display stand is how long it will take to assemble. Complex stands that require lots of tools and expert contractors to install can easily send your exhibition costs spiralling out of control; but a simpler solution like the Twist flexible display banner provides the same impact without any add-ons or hidden costs. You don’t need any tools to assemble a Twist display banner. The frame simply slots into place and the graphic attaches effortlessly. Even when you are linking multiple banner stands together, it only takes one person a matter of minutes to build. The key to a successful exhibition is to make your stand your own. Effectively, you need to create an extension of your company that reflects who you are, your values, your products and your ethos. To do this, you need to invest in accessories to personalise your display. The Twist banner stand range comes with a whole host of accessories to help you bring your brand to life. Whether you need an iPad holder, a shelf for literature, a monitor bracket or a promotional counter – Twist offers it all. This means you can create a custom exhibition stand that really reflects who you are without spending a fortune. The iPad stand and AV monitor allow you to create an interactive exhibition stand without the hassle. With the rise in experiential displays, it is worth having an iPad or a TV on your stand to play promotional videos or for competitions to engage visitors. Being modular, Twist flexible displays are one of the most budget-friendly options you can buy. 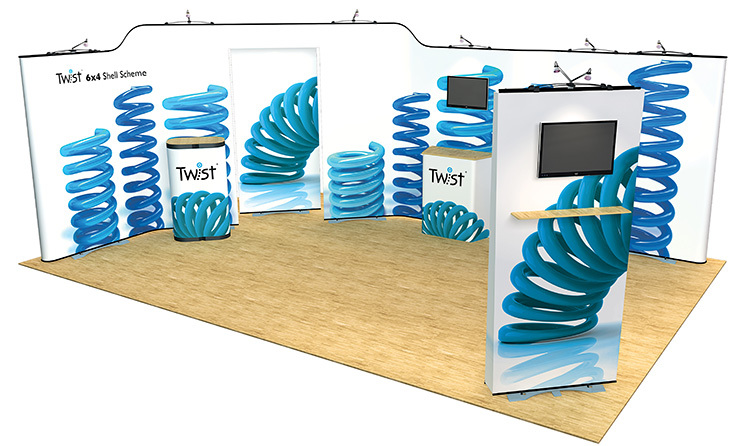 With the option to dismantle banners or add and adapt the display stand to suit each venue, Twist exhibition stands save you the hassle of having to invest in a new stand each season. Not only is this easier and time-saving, but your wallet will also thank you in the long run. To find out more about Twist banner stands or to get your own, contact us or call 01733 511030.